A 2 hour introduction to surfing! If you join a beginners group lesson you will get to cover a lot in 2 hours and get a good wave count behind you! If you haven’t surfed for quite a while or have never surfed before the group beginner lessons are a suitable level. 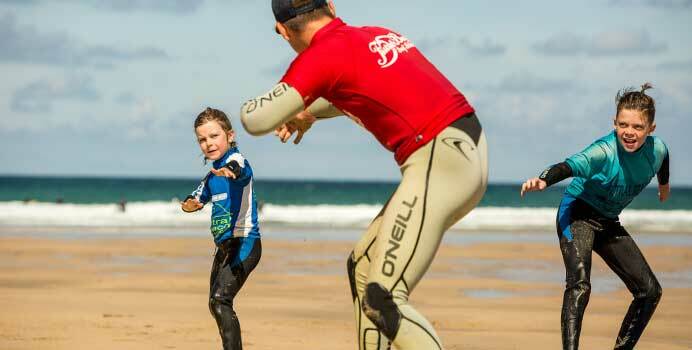 You get to cover everything from how to carry the surfboard, catching a wave and various ways of standing up. This is all mixed in with plenty of water to get your practise. All instructors are passionate about making sure you get as much feedback as you can in their lessons, our instructors are all qualified beach lifeguards and surf instructors. Enjoy discounted surf hire once you have had lessons with us!